Dada Vaswani, spiritual guide to millions passed away this week. Much like a Bodhisattva in Shantideva's prayer (which he often quoted), he was a lamp for those in darkness, a guide to those travelling the path and a boat to those wishing to cross over. As I read some of the tributes pouring in from all over the world for this humble sage who indeed was a "Perfect Disciple, Reluctant Master", my heart bows down in gratitude for all the wisdom "caught" by simply being in his presence. I started attending his public talks and meditations from a young age and over the years was blessed seek his guidance on the inner journey. Simply being around him, would be enough to dissolve all my questions and we would end up sitting in quiet communion for a few moments. Then being the incredible story-teller he was, he would thrill my heart by sharing stories from the lives of Rumi, Attar, Mira, Kabir, Francis et al as if he were talking about childhood friends. Looking back I realise that he was subtly planting powerful seeds in my consciousness for leading a life of devotion. When I received news of his passing, I reflected as to what is the best way to express gratitude to Dada and honor his journey. As I sat in a prayerful silence, Dada's message came to mind: "We all start our journeys as wanderers, few become seekers, fewer still pilgrims. A pilgrim who chooses a life of discipline becomes a disciple (shishya) and only a shishya who surrenders to God will one day become a shishu (a child of God). Aspire to be a child of God, aspire to be a child of God." 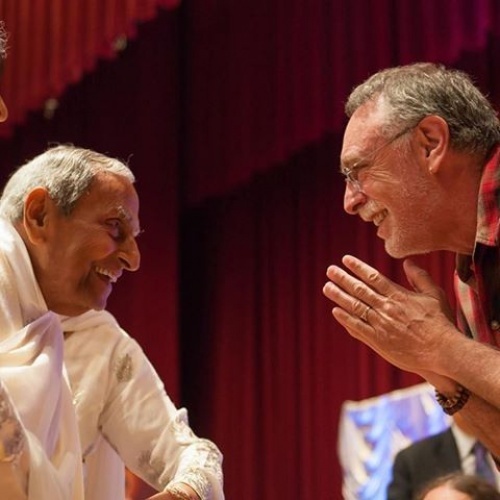 This week's artist Krishna Das offers this short video tribute with some beautiful anecdotes and touching moments with Dada. I remember a very sweet story of the time when Jayesh bhai was meeting Dada for the first time. Inspite of a busy schedule, he was inspired to walk in silence to Dada's home as an act of gratitude to honor this humble Pilgrim of Love. Spontaneously during the walk, a chant "Hare Rama, Hare Krishna" arose in Jayesh bhai's heart which he was surprised by as he rarely chants it. It was as if the mantra was chanting itself, a happening instead of a conscious action. When the two met, one of the first things Dada remarked with a mischievous twinkle in his eyes was, "Did you know that my Guru's favorite mantra was Hare Rama, Hare Krishna? He would chant it on his walks." In that moment, I realised how deeply this seemingly humble sage works with us, where he is always in tune not only with those around him, but also those on the way to meet him, and maybe even those who simply call out to him. Someone casually asked me, "Is Dada your Guru? And I spontaneously replied "Dada is more like a loving grandfather who is full of wisdom and yet childlike. And no matter how heavy a heart you go to him with, he will ensure you leave lighter. And he will always give you a goodie bag full of books and sweets to make sure you feel held in his embrace even after you are not in his physical presence." And today, though he is not with us in his physical frame he continues to hold us in his loving embrace. He once shared that to commune with God, all you need to do is sit quietly, think of Him and find Him to be closer to us than our very breath. He is the nearest of the near, dearest of the dear. The last few days, that is exactly how I have been communing with you, dear Dada. Words will never be enough to thank you, maybe a silent heart of gratitude and a commitment to walk the path home to the "cave of my heart" will be a better offering.